This is everything a pub should be and more, ten handpumps for real ale,five handpumps for cider,very cheap lunchtime food midweek.The pub has a back garden and work is ongoing on the nearly complete gin distillery. The beer is a tad pricey but this is off set by a buy nine get one card system.The pub has a very nice bright and airy decor.All of this groups pubs are excellent. No regular beers , the ten rotate and hundreds of breweries have been represented. Two handpumps normally have their own beers .10/10. 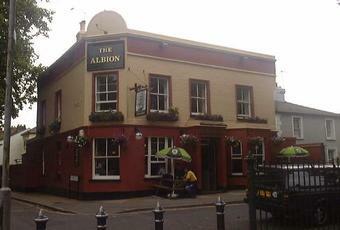 The Albion was the last of this chain of pubs I had yet to visit. So I came along to here one week night in October. All of this chain (Sussex Arms in Twickenham, Antelope in Surbiton, Express at Kew Bridge & Corner House in Windsor) are worthy of a visit, dispensing a good range of ales and ciders in nice settings. This place also served tasty pizzas and has a nice leafy setting overlooking a green. Ales were Titanic Cappuccino, Tempest Little White Cloud, Roosters Assassin & Roots Rock And Reggae, Dorking DB One, Vocation Search and Rescue, Squawk Oat Pale Ale, Big Smoke Sunshower & Solaris & XT4. Ciders were Orchard Pig Navel Gazer & Juggler, Spice Road Dry Cider & Lilley's Merry Monkey. Kentish Pip 2013 Vintage was later added. I'd venture as far as saying that this is now the best pub in Kingston. Excellent range of 10 real ales and 5 real ciders. Sister pub to the superb brewpub Antelope in Surbiton. A nice pub all round and very pleased to see they have taken to stocking Angus Whitehead's Newtons's Discovery ciderkin on draught. I had not realised it was even supplied other than bottled. Newtons's Discovery is as far as I know the only remaining commercially made ciderkin in the country. While I am a fan of real ciders in the 6% - 7.5% range, a drink that tastes nearly as good but is just 3.8% also has a useful role. Hurray, a decent beer focussed pub in Kingston. I can't believe it's taken this long. The Good :beer selection is really impressive. IIRC 10 on cask, 5 cider cask and 20 on keg. The keg selection is really the best I can think of outside of central London, many new and upcoming macros with the Lager drinker catered for too (Pauline if you ask). The staff are friendly enthusiastic and always keen to let you have tasters. Top marks to the management for including sours- they may not always b to my liking but I appreciate the effort the pub has made, I'm hoping to acquire a taste for them from the freebie tasters. The Not so Good: The food is very average, this surprises me as the Antelope (it's sister pub in Surbiton) is really quite good without being exceptional. I've had Pizza that really was quite poor, too much burnt cheese and a terrible base- if you haven't got a proper oven and don't hand knead your dough then forget about it, there are too many places that specialise in Pizza in Kingston now and people's expectations have increased over the last few years. Burgers are so so, definitely not as good as the Antelope. Sandwiches are nothing special though the home made soup was quite good when I had it once. All in all a fine addition to Kingston's pub scene, let's just hope the teething problems on the food front are resolved and we could have the perfect local.